We've probably all got a bottle of aloe vera gel stashed somewhere for the occasional sunburn. I know I was a regular user as a fair skinned kid who couldn't stay out of the sun in the summer. But do you really know all the vast benefits this plant has? And are you using it correctly? Aloe vera does two main things, reduces inflammation and deeply hydrates at a cellular level. This means it's amazing for topical use on skin irritations but also internally for inflammation in the body and to aid in increased hydration. 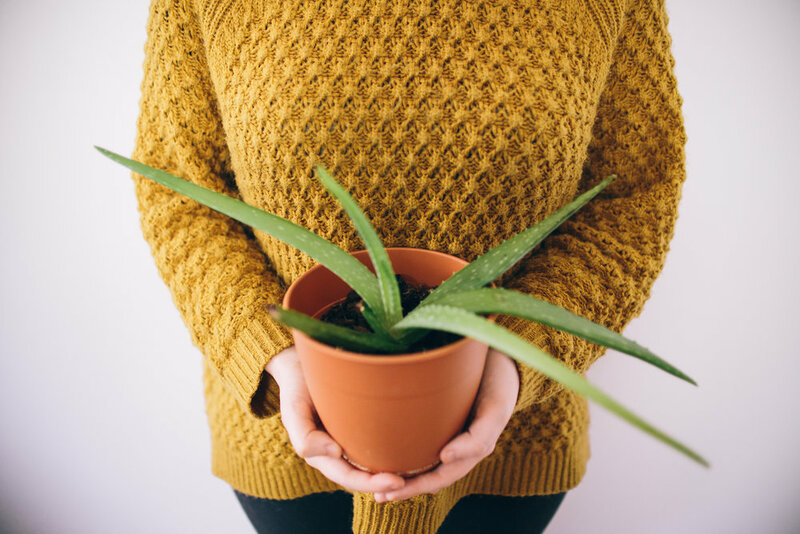 Aloe vera is very east to grow year round indoors as a potted plant. For external use this is the best source! Simply remove a leaf when needed, slice it in half lengthwise and rub the inner leaf on the area of concern. Most drug store aloe gels contain very little actual aloe. Instead they have other medicated ingredients to mask symptoms, like lidocaine or menthol. If you must buy prepackaged aloe, make sure it's from your local health foods store and is 100% pure aloe. But buying a plant is definitely the best way to go. Plus, they look super cute in your home! For internal use I recommend grabbing a gallon of "George's 100% Aloe liquid" from your local health food store, or online. It's pure, fractionally distilled aloe without all the pulp so it literally tastes like water. This stuff is liquid gold! Those are my favorite ways to use this incredible little plant. What's your favorite way to use Aloe?